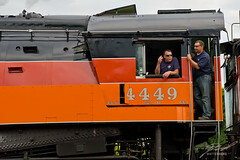 Adalay, Lawrence of Berkley, and joseph645, and DNO_Dennis headed up to Durand, Michigan Sunday afternoon to witness the arrival of the Southern Pacific 4449. After arriving they sat for sometime allowing the masses which had assembled for the arrival to get up close. Having worked with the Steam Railroading Institute I grabbed many shots of the crew in the cab so it seemed natural here too.